The leaves were falling and fading and we knew we had to get Kelsey and Matt their fall engagement session they wanted. November was so so wet, like I remember more rainy days than sunny days in November. We finally got these guys scheduled and they met us out at Centennial Park. The day was windy but beautiful and we were so excited there were still a lot of coloration for these lovebirds. Our time with them was so much fun. We were bummed we couldn’t do their double date afterwards to dinner or lunch but they did come back and have some of my famous chai in our home… (Kelsey, it’s the best, isn’t it!?) We are so excited to see you guys again and do our date! We met Brooke at a bridal show at Turf Valley earlier in the year and she ended up being our engagement session winner. I remember when I met her and we talked, she was so sweet and kind. When we found that she and Nick wanted to meet with us and hire us for their wedding, we were so excited. 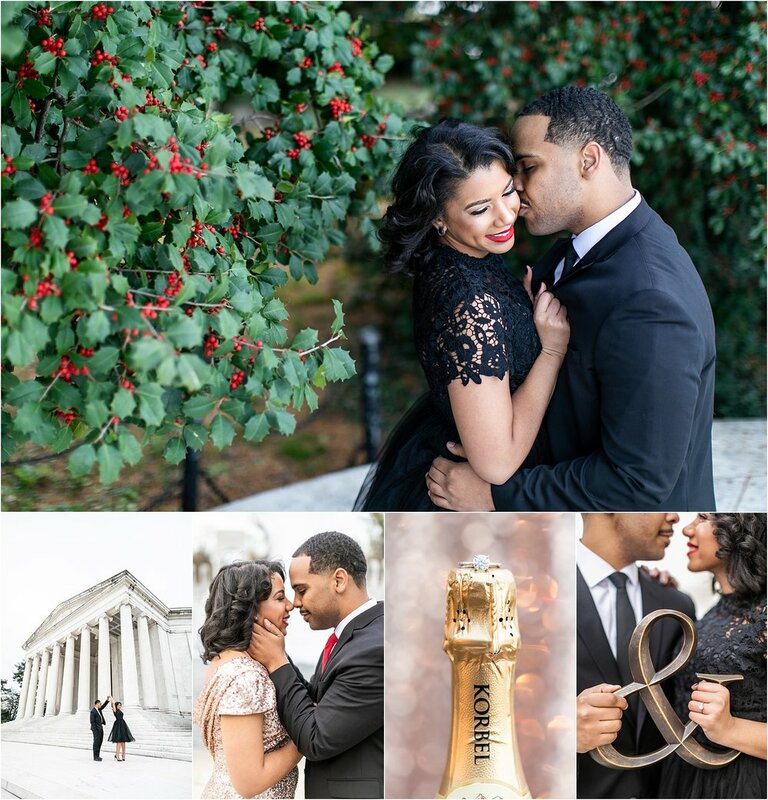 These two lovebirds get married in March 2019 and we spent our time with them for their session in DC. We literaly galavanted all over the mall in DC from the Jefferson Memorial to the Reflecting Pond and the WWII Memorial. We met these lovebirds at a bridal show and they were the winners of the session giveaway. Kendria and Gladstone are getting married in the Dominican Republic (please take us with you) and it’s going to be beautiful! These two did great and Kendria’s dress was my favorite. The two of them together looked so incredible. I’m so excited for these two and the journey they are on! These two dated in Old Ellicott City and had their first kiss in Old Ellicott City, so it was fitting to do their photos in Old EC. Unfortunately, EC isn’t the same as it used to be, so we had to venture around and find hidden beauty in the rubble. Thanks so much Lauren and Kyle for allowing us to move about, see what we could do with limited locations in a super cute town. This town means a lot to all 4 of us and we are so glad we got to spend time getting to know each other in a town we all love. Oh and that Manor Hill Tavern… we’ve gotta go back and order enough food to have left overs. Clearly we were hungry the first time haha. And Holy Smoke… what a good one. Guys, we can’t wait for your wedding in December! It’s gonna be here so so soon! Oh Annapolis. Sometimes I think I probably should have been an Annapolis raised girl, only because I love the water, love to sail, love the feel of small towns, local shops, unique food, and love our country and our military. When James and Jenn said they wanted their photos to be some where different, somewhere not in Baltimore, I knew where to take them. They really wanted photos throughout Annapolis, including at USNA. So, we ventured throughout town. We of course picked by accident the same day as a huge boat show right down Ego Alley, but even still, you wouldn’t have known that Annapolis was swamped with boat show peeps. Jenn and James, we loved our time with you. Thanks for letting us go a little longer than we were supposed to get you a pretty sweet night shot. Amanda and Rob, Patrick and I think the world of you both. We are honored we know you, you’ll forever be one of our favorite couples for tons of reasons that you’re aware of and not aware of. Congrats on 1 year! Loved our time with you in Fells Point and can’t wait for our double date!